BERLIN - Germany's Federal Network Agency (BNA) has launched its second joint onshore wind and solar photovoltaic (PV) tender, with a total capacity of 200 MW. A maximum guaranteed subsidy payment has been set at 87.50 per MWh for both energy sources, which BNA says will have to compete against each other for the lowest price of electricity. According to auction rules, all projects must have a minimum of 750 kW. The auction is due to be completed on 2 November. Bids also require network and system integration costs to be included. According to Germanys Renewable Energy Act (EEG), two joint onshore wind and solar auctions must take place each year between 2018 and 2021. After this, the government will review the scheme and decide whether to continue it beyond 2021. The first tender, conducted in April, saw the entire 200 MW capacity given to solar PV projects. Of the 32 contracts awarded, value varied from 39.60 per MWh to 57.60 per MWh. Among the winning bids were five projects in agricultural and grassland sites in Bavaria, totalling 31 MW, and three in Baden-Wrttemberg at 17 MW. According to the Agency, the joint tender scheme was initiated in an attempt to determine the financial support requirements for wind and solar in technology-specific auctions, however, solar powers sole win in the April auction meant it was met with criticism. 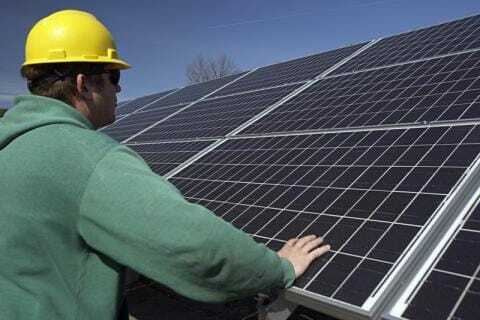 The heads of the Federal Solar Industry Association (BSW-Solar) and German Wind Energy Association (BWE) saying the joint tender scheme is unsuitable for the build-out of the two technologies. Technologies that are in various stages of development must not enter into direct competition with each other. Otherwise, innovation and development potential will be compromised. Similarly, BSW-Solar president Carsten Krnig said: We are happy for the many solar winners, but consider the experiment a failure. The auction results prove the excellent price-performance ratio of new solar power plants, but not the suitability of joint tenders.